All through the month of November I have been enjoying cooking from The Bonne Femme Cookbook, a collection of simple French recipes that most of you should be able to easily reproduce in your own kitchens. 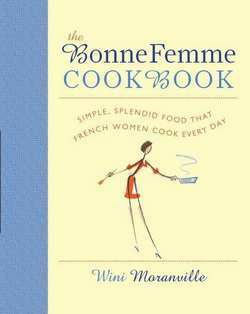 Wini Moranville wrote these recipes with the same notion that fires Easy French Food: everyday French cooking is not complicated. By relying on fresh ingredients and staying flexible, you can enjoy French food no matter where your kitchen might be. This book is more than just a cookbook though. Wini adds in delightful stories of her own experiences living and eating in France, as well as many useful tips covering everything from French meal planning to how to poach a meringue. All of these engaging tidbits are sprinkled around the recipes along with some lovely, whimsical drawings (by the illustrator Nishan Akgulian) - making this a fun book just to sit down and read. I have tried a dozen or so recipes and they have all worked. And what's more, they were pain free. Here is a suggested menu and the recipes you will need to create your own French meal at home. The hardest part about this recipe was resisting the temptation to eat the freshly roasted vegetables before they got put in the soup. This is one of those recipes that will make your house smell great, promising of the delicious meal to come. Spread the vegetables, onion, and garlic in a single layer on a large rimmed baking sheet (if they don't fit in a single layer on one sheet, use two). Drizzle with the olive oil and toss to coat. Season generously with salt and pepper. 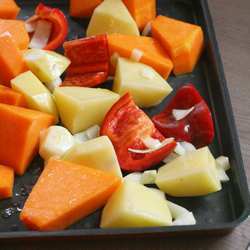 Roast until the vegetables are tender and lightly browned, 25 to 30 minutes. (You do not need to stir the vegetables.) If using two baking sheets, rotate their oven positions after about 15 minutes. Cool the vegetables slightly. Working in batches,puree the roasted vegetables in a blender or food processor, adding the parsley to the first batch. Blend or process until smooth; if needed, you can add 1/2 cup of the chicken broth to each batch to help the mixture puree more easily (I find this is especially necessary when using a blender). Transfer the pureed vegetables to a 4-quart pot. Stir in the remaining chicken broth; heat the soup over medium heat, stirring occasionally. Taste the soup; if it seems sweeter than you like it, add a little white wine vinegar. To serve, ladle the soup into bowls and garnish each serving with snipped fresh chives, if you like. Makes 8 hearty first-course or side-dish servings,or 4 to 6 main-dish servings. Oops - I used salmon fillets with the skin on. Still, it came out fine. Season the salmon with salt and pepper; set aside. Melt the butter in a large skillet over medium heat. Add the leek and cook, stirring, until tender but not brown, 4 to 5 minutes; add the garlic and cook, stirring, until fragrant, about 30 seconds more. Add the wine and bring to a boil; place the salmon fillets in the pan. Return the wine to a boil and reduce the heat. 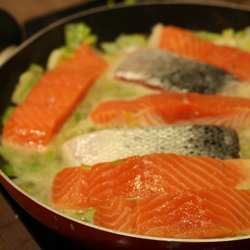 Cover and simmer until the salmon flakes easily when tested with a fork, 8 to 10 minutes. Transfer the salmon to a plate and cover with foil to keep warm. Increase the heat and boil the sauce until reduced to about 1/3 cup. Swirl in the fines herbes and cream. Season the sauce with salt and pepper. Serve the salmon with the sauce. The only thing I would change on this recipe is to note that you should poke the raisins into the custard a bit. Mine turned black in the oven. Ease the pastry into a 91/2-inch quiche pan (not a pan with a removable bottom). Do not prick the pastry. Trim pastry so it's even with the top of the dish. Line the pastry with heavy-duty foil; fill with pie weights or dried beans. Bake for 8 minutes. Carefully remove the foil and weights (the foil can stick to the pastry); return to the oven and bake until dry and lightly browned, 3 to 5 minutes. If the pastry has puffed significantly in places, flatten it with the back of a spoon (taking care not to make a hole in the crust, which could cause the filling to leak). Set the dish on a wire rack to cool. 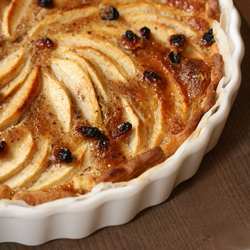 Reduce the oven heat to 350 degrees F.
Peel and core the apples and cut into thin slices; arrange the slices, fanning in a circular patter if you'd like like, in the partially baked pastry shell. In a medium-size bowl, beat the eggs, add the cream, granulated sugar, and cinnamon and beat just until blended. Pour the custard over the apples. Scatter the raisins over all. Cover any exposed edges of the pastry with foil to prevent overbrowning. Bake until the apples are tender and custard is set, removing the foil for the last 10 minutes of baking to allow the edges to brown, about 50 minutes. Transfer the pan to a wire rack to cool for 1 hour (refrigerate after 1 hour if not serving at this point). Just before serving, sprinkle the top with confectioners' sugar. cover and refrigerate leftovers for up to 1 day. Miam. Boy that was a great meal! You will find many more and lots of French fun in The Bonne Femme Cookbook. Wishing you a Happy Thanksgiving if you are celebrating, and in any case a most joyous month.